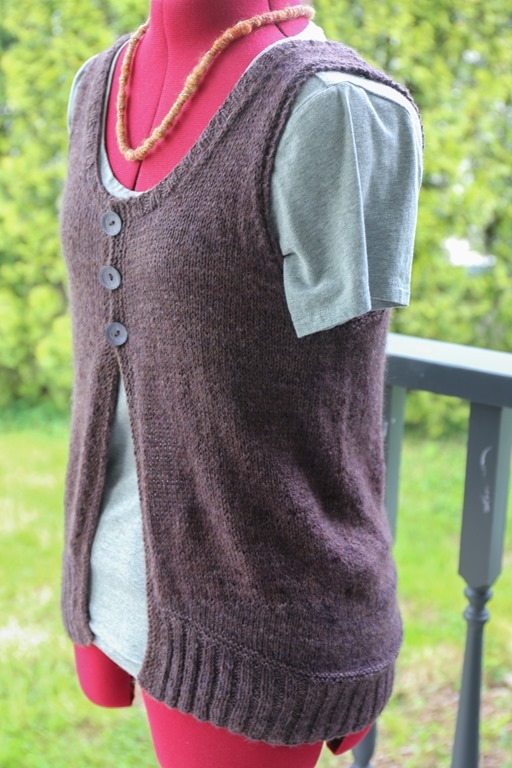 This is the third part of series of posts that I’ve done this past couple of weeks on sweaters I’ve knit over the past year that never really got their own blog posts, and certainly didn’t really get any ‘time in the sun’ if you will. The first part is here and the second part, about two ponchos I’d knit last year, is here. 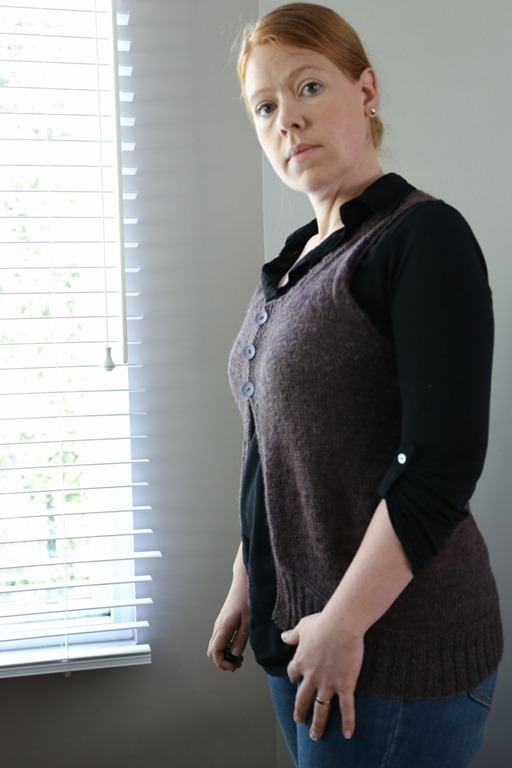 This third post is about some fitting issues I’ve had with some of the sweaters I’ve knit – namely ease and body shape. Originally, this was to be the final installment but I’ve thought of another topic I’d like to chat about in relation to sweaters: Body Image. So I’ll delve into that next time! 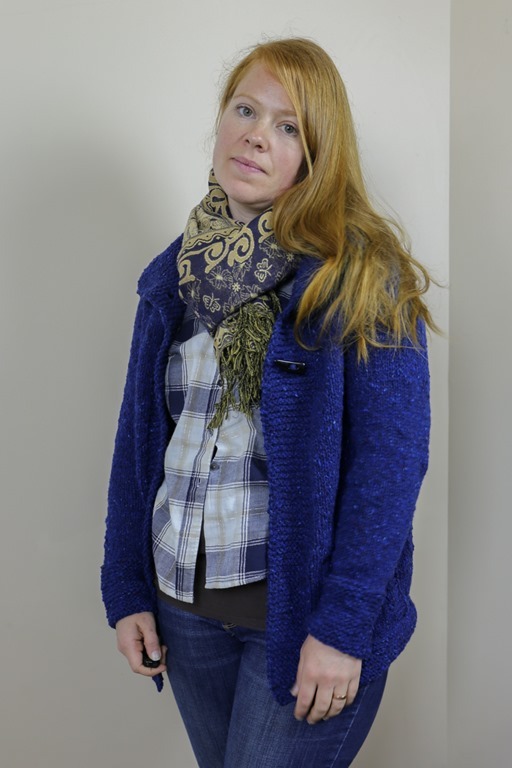 Last Spring, I knit and cast off two sweaters closely together. One was a vest that I’d had in my queue forever and the other was a stash-busting attempt. Neither have seen any wear, other than a couple of times (both of which I regretted due to fit). Let’s chat about the stash-busting sweater first! This yarn was part of a sweater quantity I’d bought quite a few years prior for a sweater for my dad. Unfortunately, it wasn’t really his colour and I knew he wouldn’t wear it after chatting with my mom about it. I ripped the whole thing out, re-wound the yarn and it sat in my stash after that. The problem was that the yarn was quite expensive and I really wanted to make something from it still! 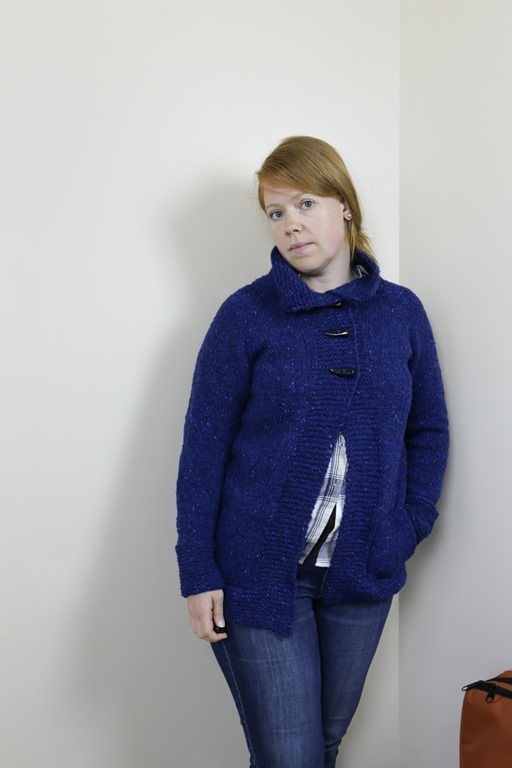 I’d seen this sweater knit up by others (this is actually the Artic Cardigan, but same idea) and just loved the look of the sweater – particularly the amount of positive ease that gave it a very jacket-like appearance. Unfortunately, it is so big that it falls off my shoulders unless I have something quite substantial underneath it – and then, I’m just too hot! Time to get a bit more personal. After my (very difficult) pregnancy with our second child, Norah, I had gained quite a bit of weight for my 5’5” frame. I’ve always carried about 10-20# extra on me for various reasons (mostly, I really like candy and oil) and had never really understood how I’d actually lost weight in my second year of University (after I’d gained about 50# and lost most of it). When I met my husband, I was maintaining my lowest weight I’d been as an adult and felt really good. We were really active and ate well. The problem was the amount we ate out and, of course, being in our mid-twenties, we drank a lot. Anyone who has struggled with weight will tell you that alcohol and weight loss are not symbiotic at all. It’s very difficult to have one and the other – it is usually either/or. After Norah was born, I spent the next two years struggling with activity due to bursitis that had developed in my right hip during my pregnancy. On top of that, I had recently gotten back into handspinning! I had started the podcast, and was spending more and more time being sedentary. It was easier when I was so exhausted! I don’t look back at these couple of years post-partum with any criticism of myself at all. It was a stage of life! And a very very important one! The kids were all-consuming (still are in some ways) and my crafting created a wonderful outlet that was quiet and still. That was so important for me in those first couple of years when I was so exhausted! Now, the problem with all of this is that sweaters like this one end up being so large on me now that they are basically unwearable! It’s just too big! I feel frumpy in it. Over the past year or so, I’ve learned that I definitely prefer my clothes more tailored. As well, I wear a lot of gym clothes. You know that saying, “Dressed for the gym, going to the gym”? There is so much truth in it! If I get ready in the morning as if I am headed to the gym, there’s a rare day that I don’t go. It’s as if that mentality to start your day sets you up to carry through without even really thinking about it. You see, while I have lost quite a bit of weight since these photos were taken, that wasn’t exactly my goal. It was a side effect of the working out. The more weight women lift, the slimmer we become! It’s like magic. Honestly. Now the real question here is: Do I rip it out to the yoke and re-knit it to fit? I love the yarn. I love the sweater. Is it worthwhile? While you ponder that question (and me too), I thought I’d chat about the fitting issues with sweater no. 2. This is actually a vest and a very cute vest at that. I absolutely love this … in theory. I haven’t tried it on recently so I will prior to posting this but here are the issues with this wonderful little number: My hips and buttock. If you click on the pattern link below, you will notice that the lovely model is not well-endowed in the buttock region. She’s also probably taller than me that doesn’t really matter. Again, when I finished this I was about 17# heavier than I am now so I’m curious about the fit then compared to present. Both of these sweaters were finished in May 2017, about a week apart from one another. To be perfectly honest, my self-esteem around modelling both of these sweaters was quite poor. 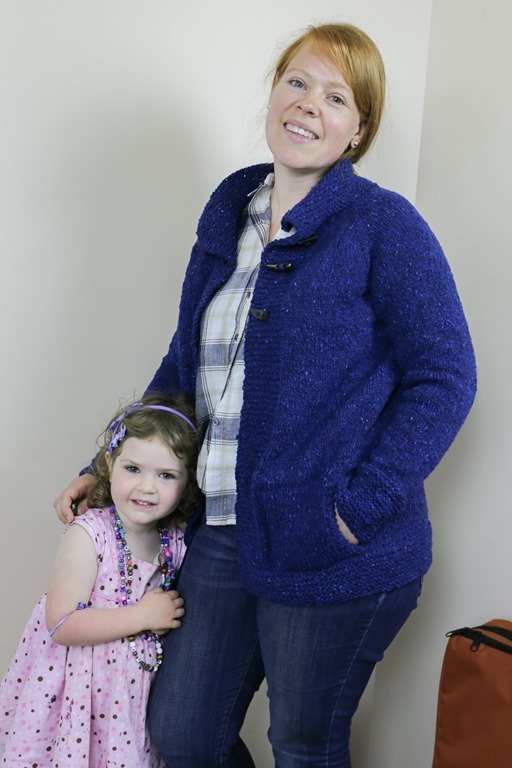 I didn’t (and hadn’t) felt like myself in a very long time – whether it was from having two children, learning to face the fact that my diet wasn’t a clean as I wanted to think it was, and I was doing ZERO exercise – the feel and look of both sweaters was less than what I’d hope. I definitely didn’t feel like a million bucks! I say that with a smile on my face because I look back at these years and know that much of it was the trenches of having two children under 2, then under 3, then under 4 for several years. My health and wellness took a backseat for several years while the kids were small. If you’ve been following along for a while, you’ll know that all of this has completely changed as of May 26th, 2017. I’d finally come to a point that I was fed up with feeling the way I was feeling! So all is not lost and this certainly isn’t a negative post about self-esteem. I knew what I needed to do and the time was imminent at that time! So, with that in mind, let me share with you the issue with fitting this vest – although, I’m sure you’ve figured it out! Due to my wider hips and buttock, the sweater bunches around the sides to accommodate my size. The amount of shaping in the side for this vest wasn’t enough to compensate for this. Whether this is still a problem or if I could block this out, I don’t know. I’ll try and report back, though because the sweater itself is so cute. 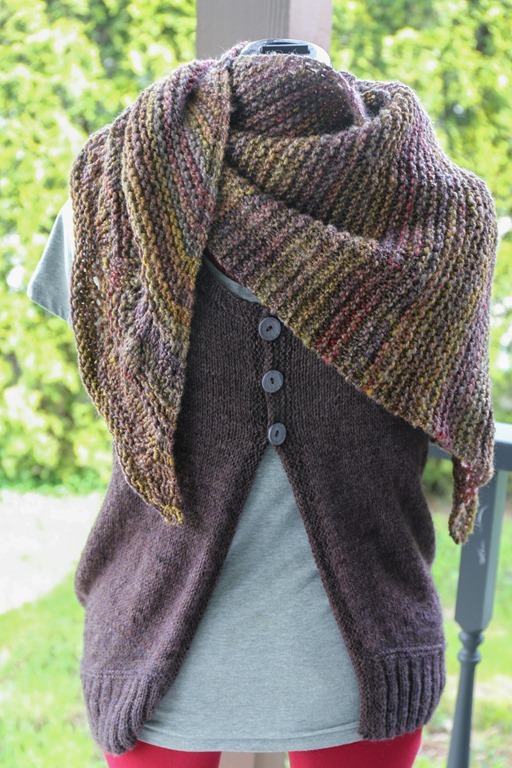 Did I mention (or did you see) that it’s my handspun? I want to get lots of use out of this if I can! Fitting is a fickle lover. Sometimes you knock things out of the park and sometimes, you don’t. Often when something doesn’t fit at the store, we put it back and think, “Bummer, not for me.” With a knit sweater, you’ve committed. You’ve cast off and committed a significant amount of yarn (and time) to the process. But not every project is going to be amazing and when I am constantly pulling at a garment, it’s not a garment I’m going to wear. That’s just fact. I can’t handle it and I always think it draws attention to the fact that it’s an ill-fitting garment. Due to wool’s forgiveness, however, there are things we can do sometimes to mitigate these fails – like re-blocking and re-knitting. Sometimes more time has to be invested and it’s worthwhile, sometimes not. I can tell you that re-blocking Shoreline in this case will be worthwhile to see if I can get a slightly better fit. If not and it doesn’t work? I’ll cross that bridge in time and report back. Next time, let’s chat about body image and sweater knitting – it’s bound to be a loaded post as I’ve thought about this a lot over the years. I hope you’ll stay posted. Thank you for reading! Curious where your next post will go. As a plus size woman, I feel like knitting garments for me will be a lost cause but I haven’t even looked at Rav yet to see if I can find plus size sweaters/cardis. I had a baby 7 months ago and my body has been influx since I got pregnant til now… but realistically from 2014 to now as I was in a wheelchair from a genetic syndrome for a year and gained a big chunk of weight before my pregnancy. I would love to hand make something I can wear besides scarves, cowls, mits and socks lol. 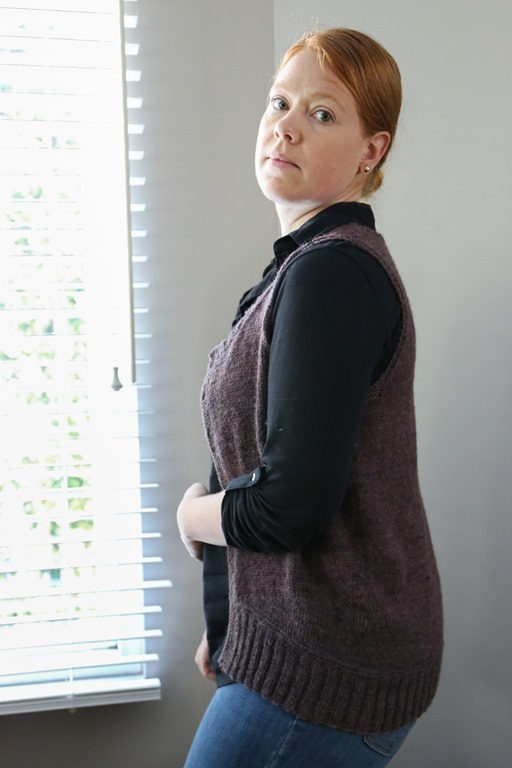 I think you should get on Rav because there are countless plus sized sweaters and sweaters knit in a larger size range — I think you’ll be surprised at what’s out there! Ysolda has done a lot of larger size ranges for example.